Of course wedding attendees will be excited to see the bride and groom on the wedding day, but they'll also be anxiously anticipating the hors d'oeuvres at cocktail hour, fanciful menu items at dinner, and the open bar. 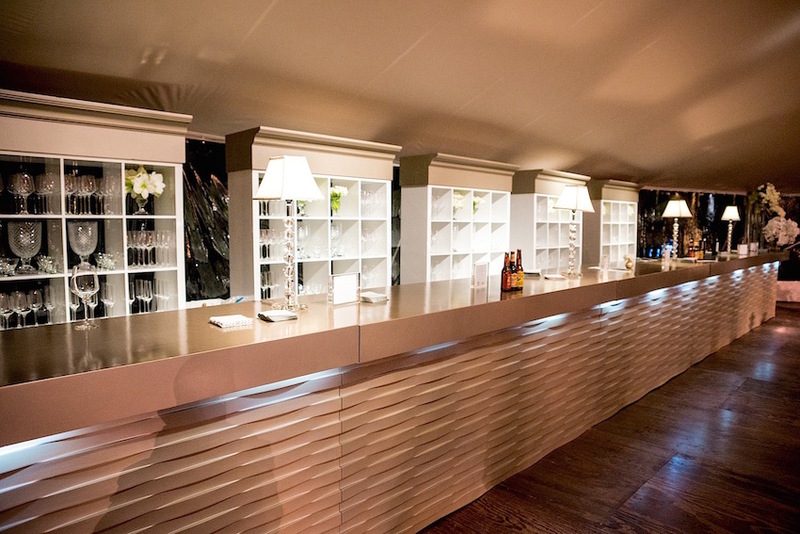 Give your loved ones something to remember forever by designing a beautiful wedding bar that complements the rest of your décor. Create custom bars using your monogram, illuminate the bar for a luxe feel, or adorn the bar with lovely fresh flowers. 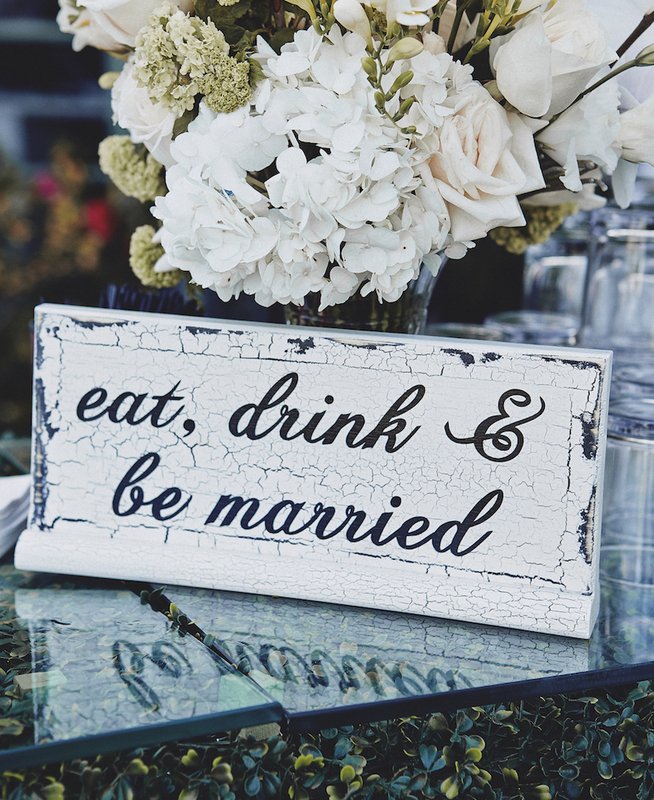 Whatever design you choose, you can also add wedding signs to your bar décor that offer romantic sayings, hint at the libations to come, or detail the ingredients in your signature cocktails. 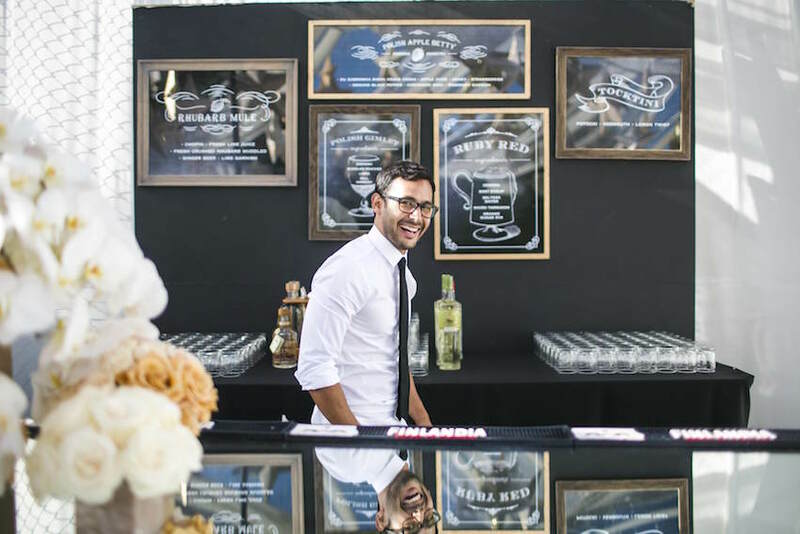 No matter how you choose to serve attendees, we've put together 17 wedding ideas for beautiful bar displays that your guests will love. 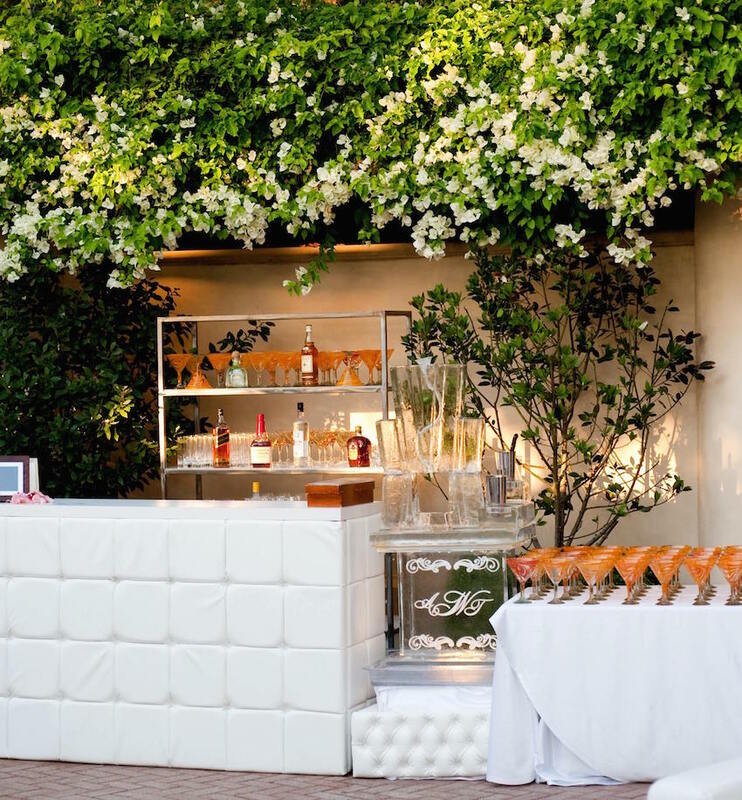 Some of our favorite wedding bars and cocktail lounges from real weddings are pictured below. Take a look and let us know which are your favorites in the comments! If your wedding colors primarily include neutral tones, such as white, ivory, or blush, keep your wedding bar in the same style. 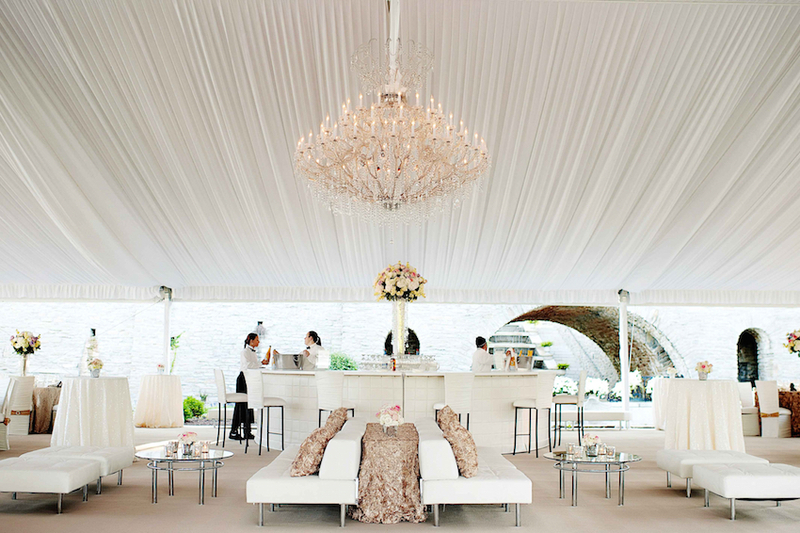 This couple's tufted wedding bar blended seamlessly into the décor of the tented reception, and a large flower arrangement of white, cream, and light pink blooms really brought the entire look together. 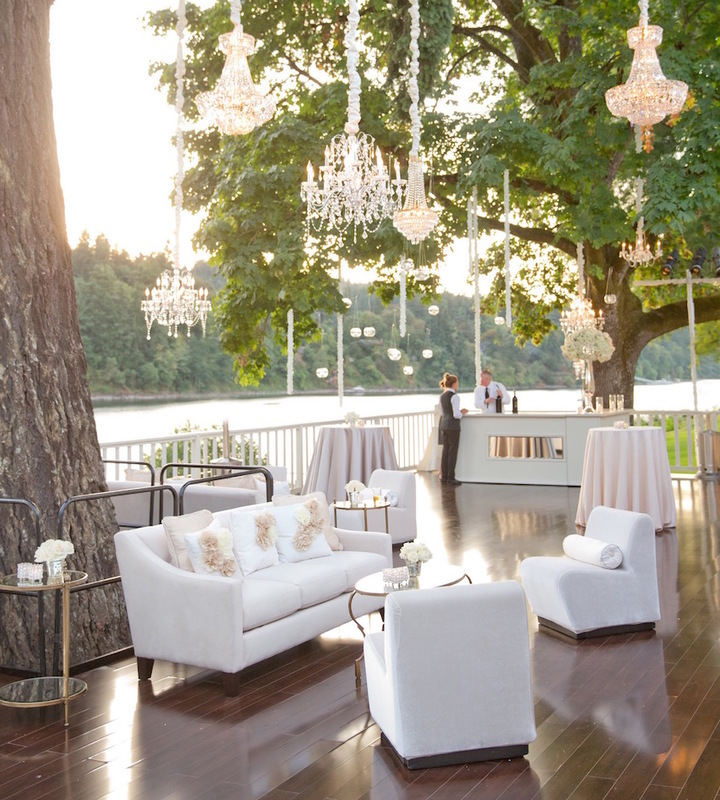 Keep your wedding bar simple, but decorate its surroundings with gorgeous crystal chandeliers and garlands of flowers suspended from tree branches. 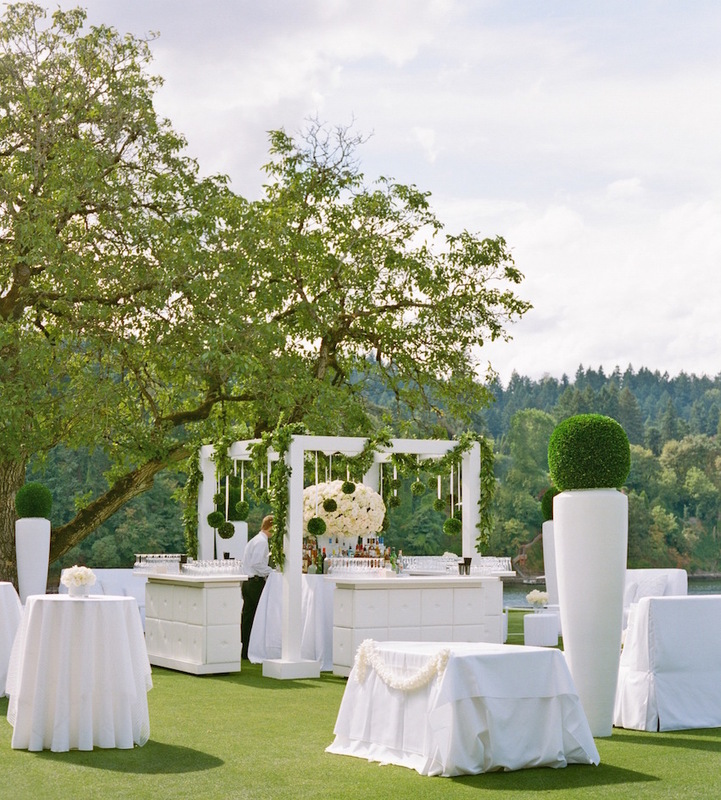 This beautiful cocktail hour was held at a country club overlooking the river, and the couple certainly did everything they could to adorn the already stunning location with impeccable décor. 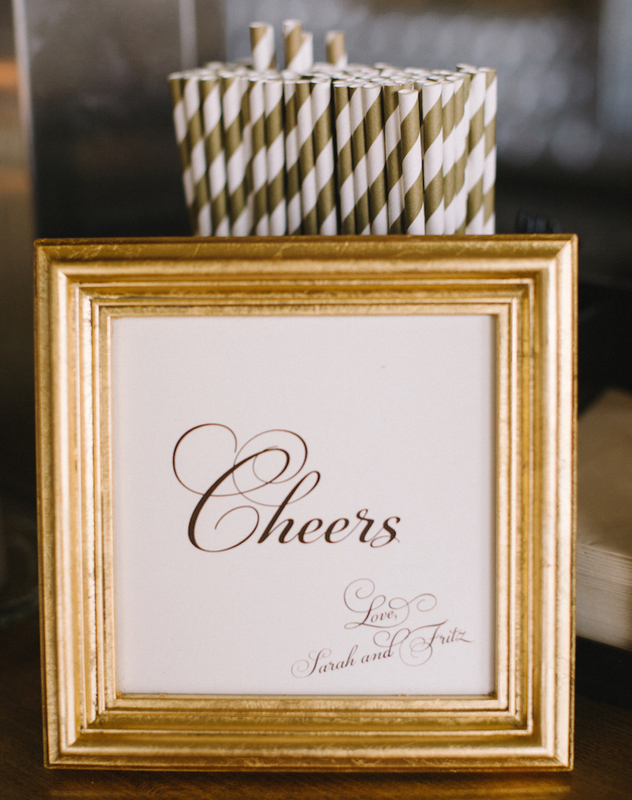 Frame a personalized "Cheers" print in a gold frame, and position it in front of gold-and-white striped straws for a wedding bar display that your guests won't be able to refuse. Create a white four-poster bar with beautiful tufted sides for a classic design. Hang topiary boxwood spheres from the top and weave garlands of greenery around the structure for decorative elements that blend seamlessly into an outdoor setting. 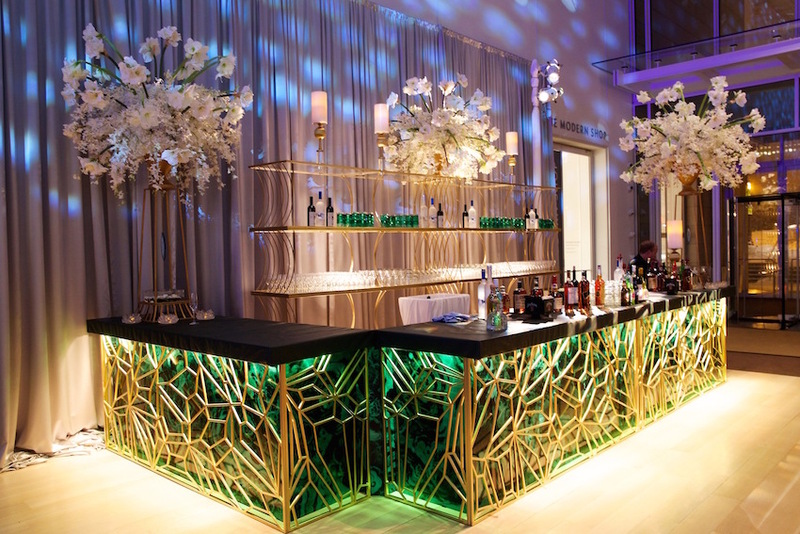 Incorporate your love of geology by creating a custom bar built of illuminated malachite panels covered with a gold geometric pattern, like this couple's striking wedding bar featuring dark green leather countertops. At this real wedding in Houston, Texas, a barmaid served Champagne from a "Bubble Bar" in the ladies' lounge. "The girls were raving about it," shares the groom – NFL tight end Owen Daniels. For a classic wedding twist on the popular phrase, UFC Octagon Girl Brittney Palmer and her groom displayed an "Eat, Drink, and Be Married" sign at their wedding bar. 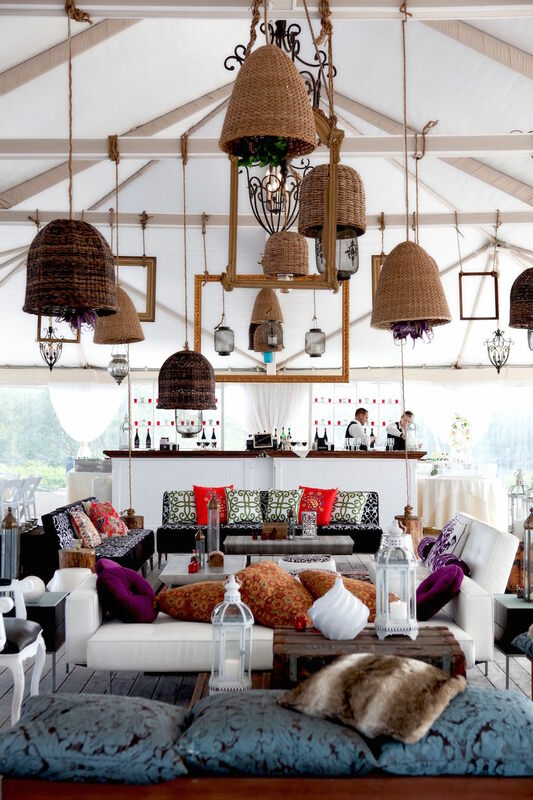 When HGTV star John Colaneri and his beloved got married in Newport, Rhode Island, the couple's loved ones enjoyed a cocktail hour in a "modern rustic" tent. A beautiful wood bar was placed beneath wicker lighting and in front of plush, patterned sofas and pillows. There's something absolutely luxurious about an ice sculpture at a wedding; however, this couple chose to take the icy décor element one step further and served ice-cold drinks from it! Add your wedding monogram for a personalized touch. 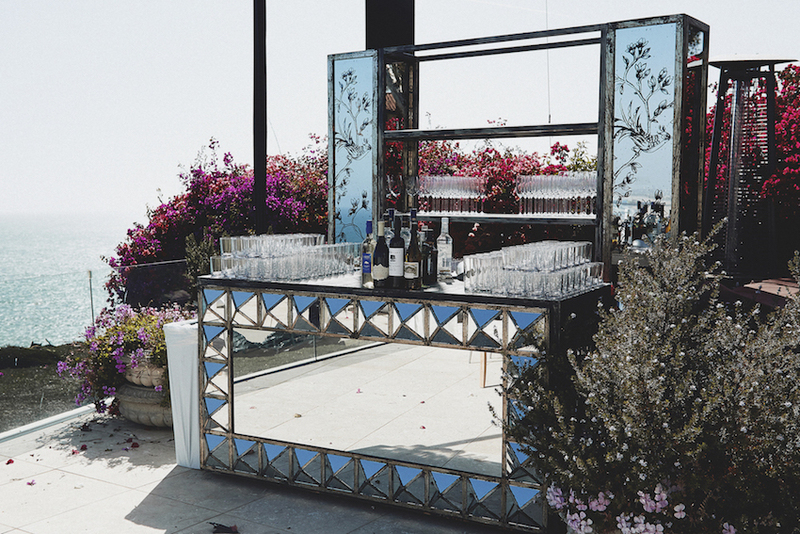 Mirror décor elements were featured throughout Brittney Palmer and Aaron Zalewski's oceanview wedding events; however, the couple's gorgeous mirrored wedding bar was one of the most unique decorations of their big day. 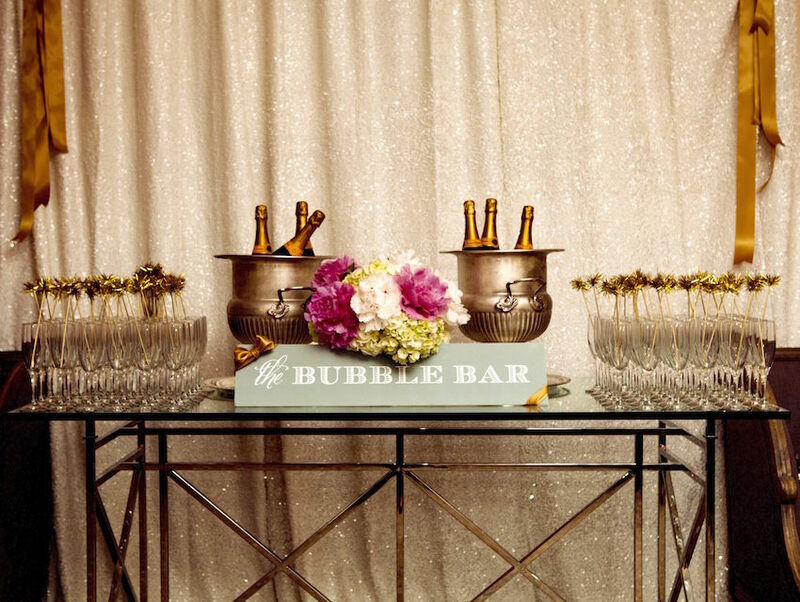 Add handpainted elements – or your wedding monogram – to a mirrored back bar for a vintage-inspired look. These days, many brides and grooms are choosing their favorite libation to be featured as a signature cocktail. Choose a favored drink as a couple, or select your own. 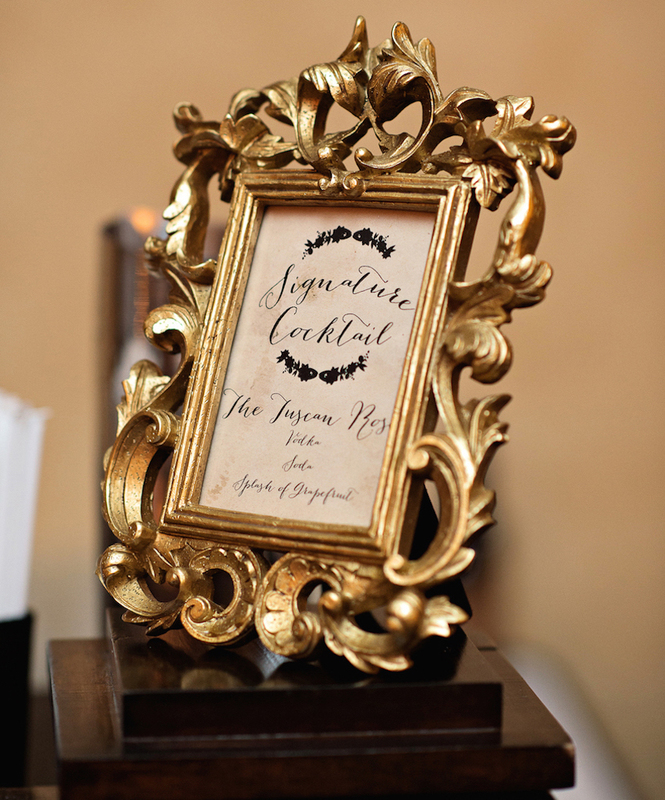 Make sure guests know what your signature cocktail is by displaying incredients in a gorgeous frame that complements the wedding décor. 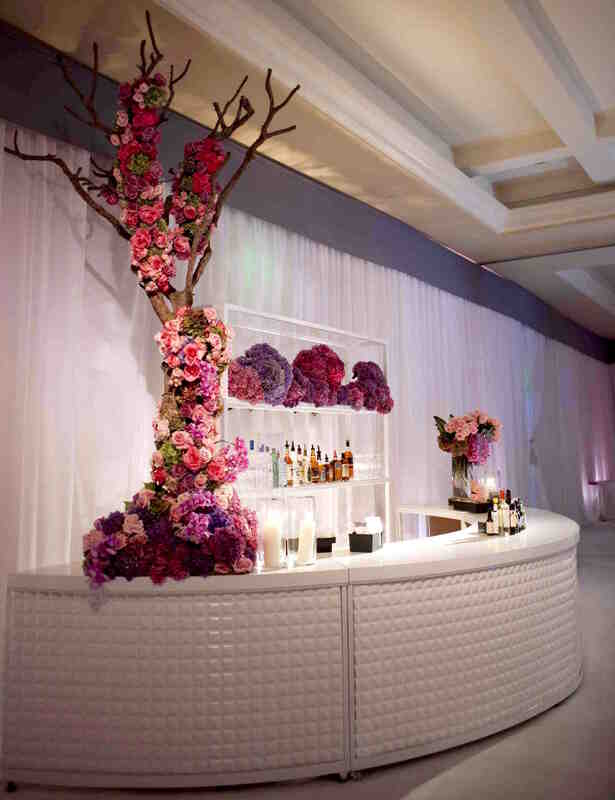 Decorate an all-white bar with bursts of color using your wedding flowers! Top an entire shelf of the back bar with billowing purple and pink blooms, fill a glass vase with arrangements similar to wedding centerpieces, or adorn branches with your favorite florals. 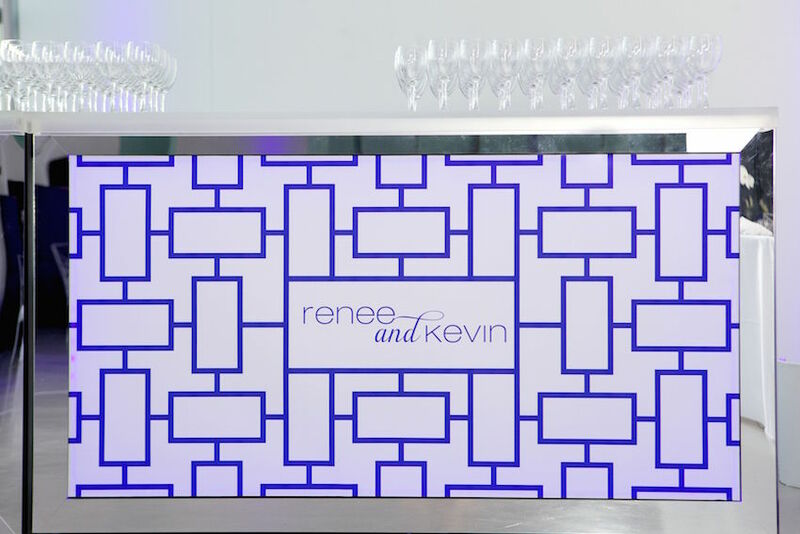 For Renee and Kevin's modern wedding, they outfitted their illuminated bar with a geometric pattern in their color palette and their names. The illuminated panel was presented in a contemporary mirror frame. 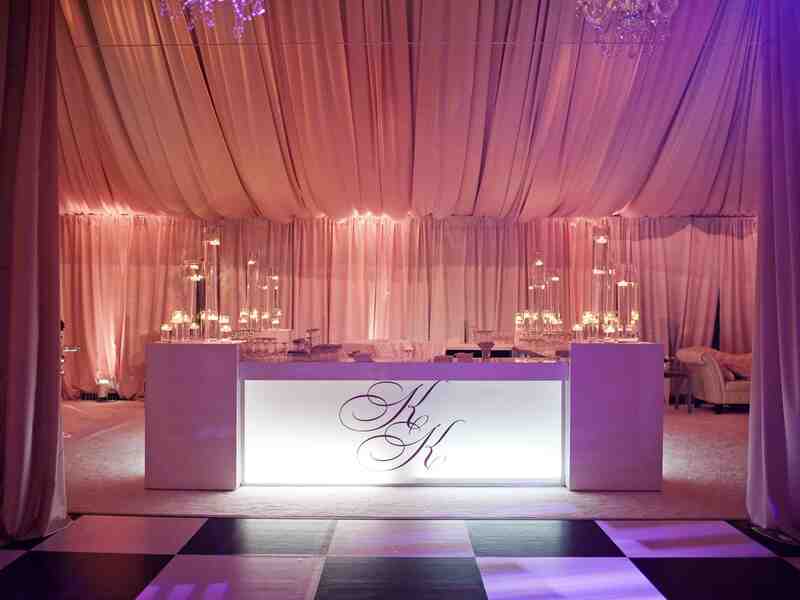 In addition to the gorgeous checkerboard dance floor and draping of this reception décor, we love the illuminated wedding bar that features the couple's monogram. To honor the bride's Polish heritage, this couple's wedding libations featured five different vodkas from Poland. 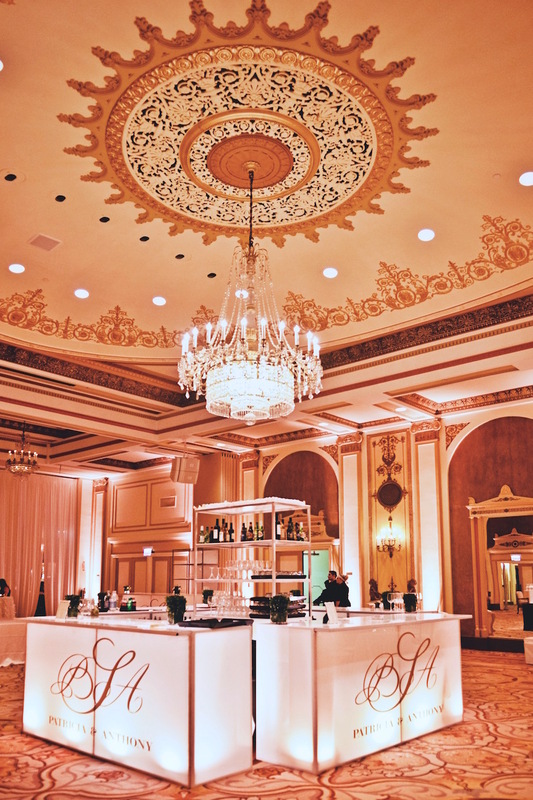 The wedding bar was decorated with modern black-and-white signs in gold frames detailing the vodka cocktails with traditional flavors, including "Polish Gimlet," "Rhubarb Mule," and "Ruby Red." Photo by Samuel Lippke Studios; Floral & Event Design by White Lilac Inc. Tall shelving units were placed behind this couple's geometric bar accented with warm lighting. In keeping with the neutral color palette of the event, shelves displayed glassware and metallic vases filled with white flowers. To give your wedding guests ultimate access to your bar, design a four-sided structure featuring illuminated panels decorated with your monogram and names. Place the bar directly beneath a striking chandelier to create an effortless element of height and luxury. Get more ideas for your cocktail hour here, get cocktail recipe ideas here, and view more food & drink ideas here.